The Global Volcanism Program has no activity reports for Camiguin. The Global Volcanism Program has no Weekly Reports available for Camiguin. The Global Volcanism Program has no Bulletin Reports available for Camiguin. Oblate, 20-km-long Camiguin Island just off the coast of north-central Mindanao Island consists of four overlapping stratovolcanoes overlying older buried edifices. Mt. Mambajao forms the high point of the island. It has a youthful morphology with summit and flank lava domes, one of which partially fills a crater breached to the NW, but has not had historical eruptions. The eroded stratovolcanoes of Mt. Butay and Mt. Ginsiliban form the SE tip of the island and lie at one end of the NNW-SSE trending line of vents cutting across the island. The Binone cinder cone lies along the SE coast. The youngest volcano, and the only historically active one, is Hibok-Hibok (also known as Catarman). It lies at the NW end of the island, about 6 km NW of Mt. Mambajao. This andesitic-to-rhyolitic volcano contains several lava domes, including Mt. Vulcan on its NW flank. Major eruptions during 1871-75 and 1948-53 formed flank lava domes at Hibok-Hibok and produced pyroclastic flows that devastated coastal villages. Alcaraz A, Abad L F, Quema J C, 1952. Hibok-Hibok volcano, Philippine Islands, and activity since 1948. Volcano Lett, 516: 1-6 & 517: 1-4. Castillo P R, Janney P E, Solidum R U, 1999. Petrology and geochemistry of Camiguin Island, southern Philippines: insights to the source of adakites and other lavas in a complex arc setting. Contr Mineral Petr, 134: 33-51. Macdonald G A, Alcaraz A, 1956. Nuees ardentes of the 1948-1953 eruption of Hibok-Hibok. Bull Volcanol, 18: 169-178. There is no Deformation History data available for Camiguin. There is no Emissions History data available for Camiguin. 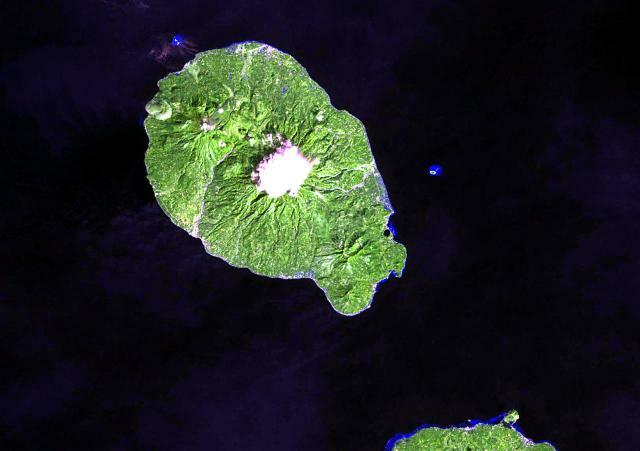 Camiguin Island, just off the coast of north-central Mindanao Island (lower right), consists of four overlapping stratovolcanoes. Cloud-covered Mt. Mambajao forms the high point of Camiguin Island at 1552 m. The youngest volcano, Hibok-Hibok (also known as Catarman), has been active during historical time and lies at the NW end of the island. Major eruptions during 1871-75 and 1948-53 formed flank lava domes at Hibok-Hibok and produced pyroclastic flows that devastated coastal villages. NASA Landsat image, 2002 (courtesy of Hawaii Synergy Project, Univ. of Hawaii Institute of Geophysics & Planetology). Mt. Vulcan (left) and Hibok-Hibok (right) are two historically active lava domes on Camiguin Island. These two domes were active in the 19th and 20th centuries, with Mt. Vulcan forming in 1871. 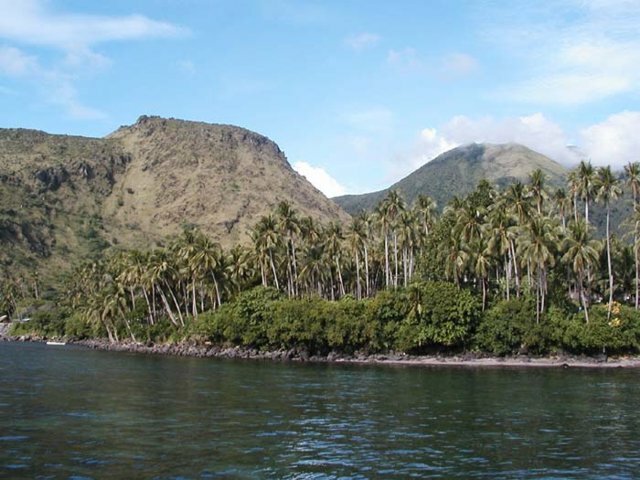 Several historical eruptions have occurred at Hibok-Hibok, the most recent from 1948 to 1953, when pyroclastic flows devastated island villages. The 20-km-long Camiguin Island lies just off the coast of north-central Mindanao Island and consists of four overlapping stratovolcanoes and flank lava domes. Photo by Juny La Putt, 2002. Mt. 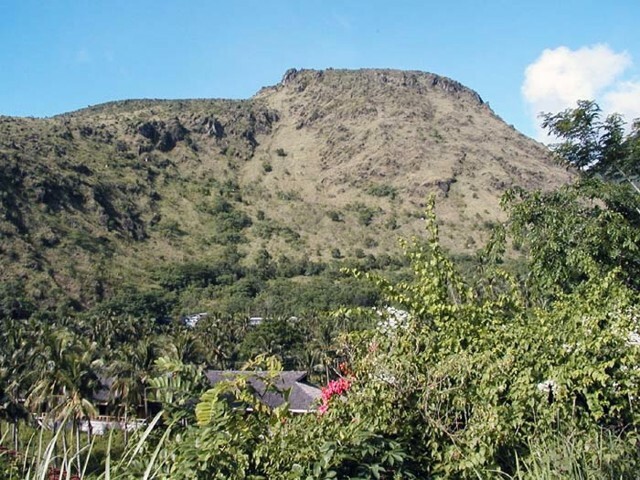 Vulcan, a lava dome on the NW flank of the Hibok-Hibok lava-dome complex, was formed during an eruption from 1871 to 1875. Following earthquakes beginning in January 1871, an explosion occurred on April 30 from a vent on the northwest flank near the coast, destroying an area of 3 km radius. Explosive activity continued for about a week, after which lava effusion began. Dome growth lasted for four years, producing by 1875 a dome about 1.6 km in diameter. There are no samples for Camiguin in the Smithsonian's NMNH Department of Mineral Sciences Rock and Ore collection. Large Eruptions of Camiguin Information about large Quaternary eruptions (VEI >= 4) is cataloged in the Large Magnitude Explosive Volcanic Eruptions (LaMEVE) database of the Volcano Global Risk Identification and Analysis Project (VOGRIPA).